Since I am a hyphenated American-Jew, whenever I come across a Jewish-American novel – new or old – I always wonder whether or not I will identify with the experiences of the characters. What I have found – and as anyone who reads my blog can see – is that I identify with the schlemiel character. But this is a general identification. I often find that I am interested in some schlemiels more than others. Some, for instance the schlemiels in the novels of Gary Shteyngart or Philip Roth, do not resonate as much as schlemiels in other novels. The reasons for my attraction or repulsion do not have to do with the fact that I do or do not share traits or problems with the given character. To be sure, I think I have found a standard that many people would likely agree with: schlemiels that are excessively caricatured are less meaningful than schlemiels that are less caricatured. Indeed, the sign of a good-writer-on-the-schlemiel can be found in how they balance humor with seriousness in his or her stories or novels. After all, schlemiels fail and failure is…a serious thing. The art part comes in with regard to how one address failure. If one does it right, the reader can come to the text with a sense that what they are reading is simultaneously comic, utterly serious, and worthy of his or her concern. 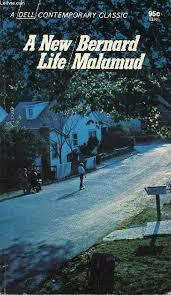 Unlike many writers who address the schlemiel, I am now finding that Bernard Malamud stands out in his treatment. His work, though written for another era, speaks to me, even today. I recently came across a used, 1961 edition of Bernard Malamud’s novel, A New Life. On the back cover, I read something that I have never seen on any back cover: the mention of the word schlemiel. In a New Life, Bernard Malamud has written a novel that is at once devastating satire on academia, a ribald comedy, an ironic commentary on East Coast Experience and West Coast innocence – and above all, a profoundly moving fable of redemption and rebirth, a Pilgrim’s Progress of an unforgettable holy schlemiel. Another thing that concerned me was the question of how “ribald” a comedy it was. Was S. Levin a caricature? How much comedy did Malamud inject into the creation of the schlemiel? With these questions in mind, I picked up the book and started reading. How, I wondered, would S. Levin “leap” and “lighten” – in an “eyeblink” – America’s (not Ireland’s) “western welkin”? Welkin is Old English for sky or heavens. The irony here is that in Malamud’s revision Levin is a Jew who, in migrating West from New York City, will somehow bring light to the dark American sky. How could this be? Would he do something redemptive? Hopefully, by the end of the novel, I thought, I can answer this question. After all, the notion that a schlemiel is redemptive is of great interest to me. What is Malamud after? Levin is a schlemiel who wants to stop living a life of failure. To this end, he takes the Jewish wisdom of changing your place changes your “mazel” (luck) seriously. He leaves for California (“a strange land”) to start a “new life.” There, he will take up a job as a college professor of composition. But there is a problem: although you can take a schlemiel out of New York, can you take the New York out of the schlemiel? Can a schlemiel, by leaving New York for a new life, also leave the schlemiel behind? Is it associated not just with a way of life but also with a city where Jews lived en masse? This initial gaze is telling since the gaze is not so much at the Jew (which is cloaked by the narrator) as at the stranger who is about to come into their life. Malamud tells us that the man, who is “almost in alarm,” is energetic and has a “rich head of red hair.” Reading this, I cannot help but think of the Biblical figure of Esau – the brother of Jacob. According to the Midrash, he has red hair all over his body. The Midrash suggests that this matches his essence: he is a hunter and more athletic than his intellectual and humble brother, Jacob. What I love about this initial encounter is the fact that Malamud suggests that we think of the struggle between the schlemiel and a possible Esau as a struggle of epic, biblical proportions. This gives the schlemiel a context with more gravitas and weight. How does Malamud balance out the weight and the comic lightness of the schlemiel?